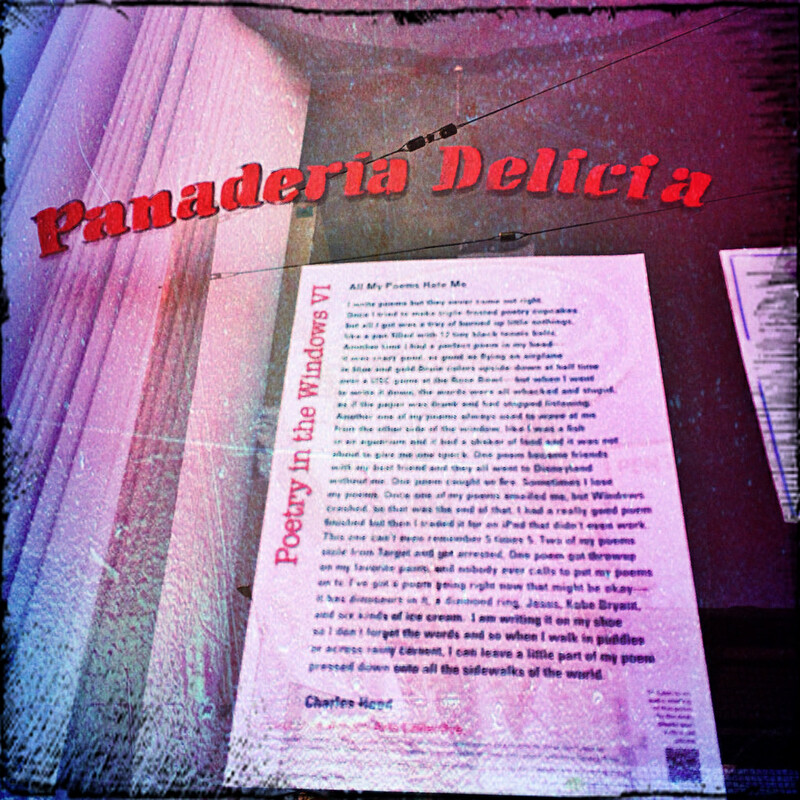 Poem, “All My Poems Hate Me” by Charles Hood in the window of Delicia Bakery on Figueroa. For 25 years, The Arroyo Arts Collective has been keeping the great flame of arts heritage alive in Highland Park. Besides their annual Discovery Tour, puppet productions, and temporary art installations, their great contribution to culture in Northeast Los Angeles has been the written word in the form of poetry. For the sixth time in 19 years, The Arroyo Arts Collective has mounted the wonderful public exhibition, Poetry In The Windows. Poetry in The Windows is just that: Poetry in the windows! Poems placed in the business windows along Figueroa Street from Avenue 55 to Avenue 60. There were over two dozen Highland Park businesses participated in this edition of the PITW. Places as diverse as Chez Antonine, LAs Cazuelas, Twinkletoes Dance Studio, La Plalapa, Future Studio, Marcello’s Hair Salon, Bird Man Pet Shop, Slow Culture Gallery and Bearded Beagle Vintage put up the poems from contemporary poets in their windows. 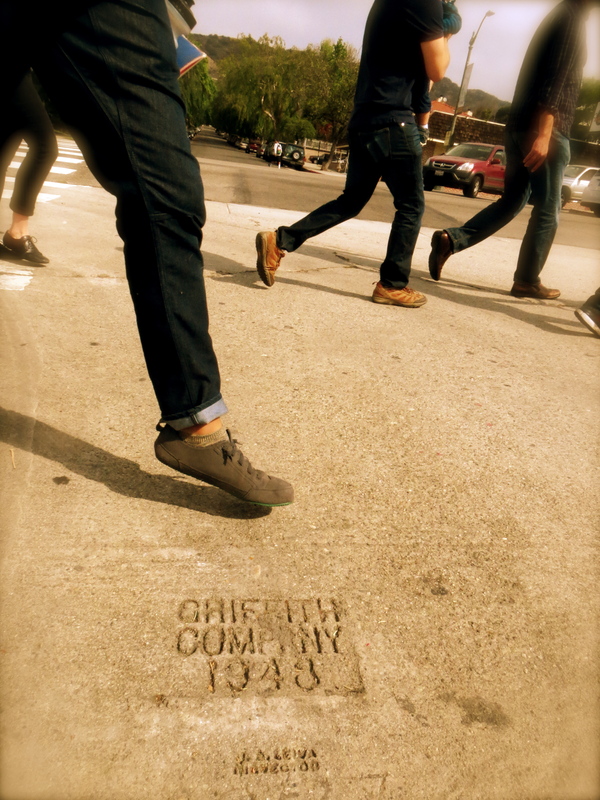 On Saturday, the 19th Day of the National Poetry Month of April, Arroyo Arts Collective held a special Poetry Walk that set off from the Highland Park Ebell Club over to Figueroa Street to see the poems and hear the poets read their works. This was made extra-special by the presence of Poet and Highland Park daughter, Suzanne Lummis who made a special effort to have each business owner step outside and hear the poets read their poems to them. The poems are scheduled to be up until May 31, but this being Highland Park, you will likely see them well into the summer and beyond. Poet, Helene Cardona and her poem, "Woodwork" in the window of Highland Thrift Appliances. Picking up the Poems at the Highland Park Ebell Club for April 19th’s Poetry Walk. Poet, Mary Torregrossa with Day Laborer / El Jornalero at Eagle Rock Realty Investments, Loans & Income Tax. Poet, Jenny Factor reads her poem, "For I have washed your jeans and new embroidered shirt…" to the owner of the Cleaning Lab. Strange Trees and Fault Lines by Charles Hood at Ave 50 Studio. Poet, Sonya Sones reads, I Was Sitting Just a Few Feet Away from Wanda Colman’s Hair at Marcello’s Hair Salon. Poet, Charles Happer Webb with the owners of Bird Man Pet Shop. tags: cd14, community, Highland Park, park, public space, york blvd. Adults and kids alike get to play in the sandbox of park design. 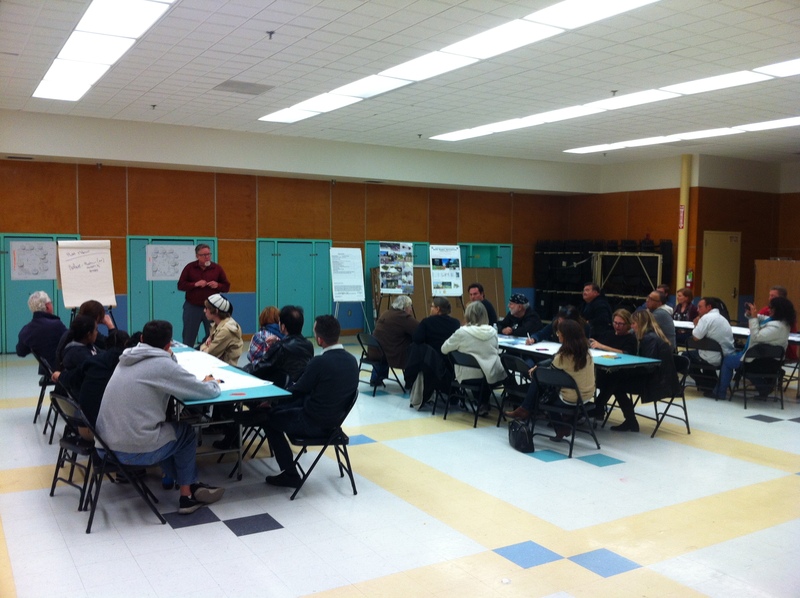 Tonight was the third York Park Planning Workshop for the vacant gas station lot at Avenue 50 and York Blvd. 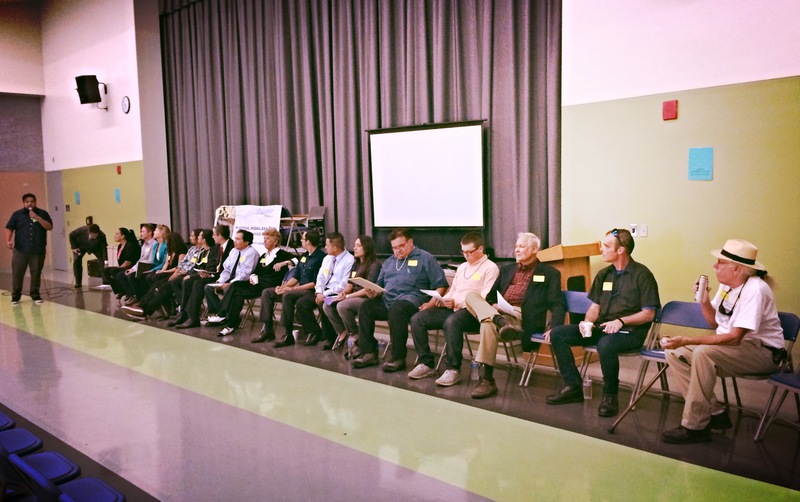 About thirty Highland Parkers attended the two-hour event at Buchanan Elementary School, facilitated by the office of Council District 14 Council Member José Huizar. 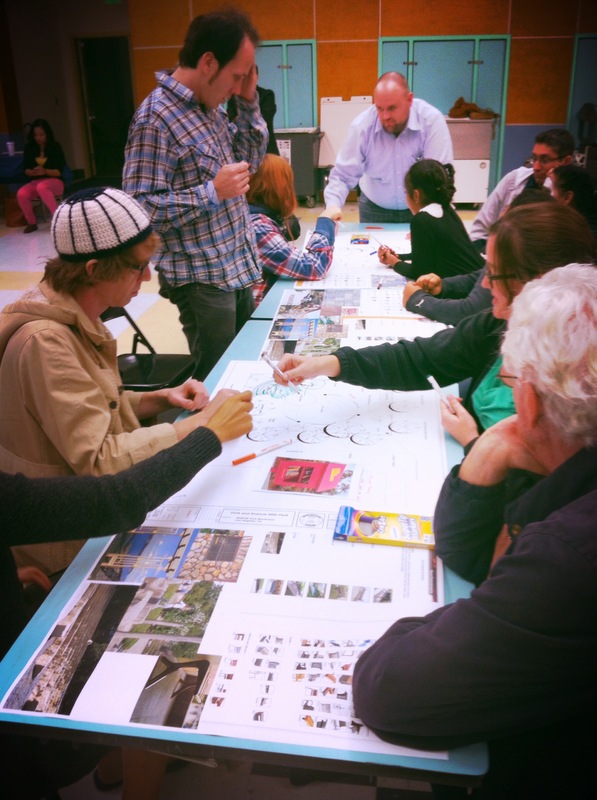 Design options that the City could implement were presented followed by the community getting to play in the design sandbox by drawing on copies of the general plan. Over the past two planning workshops, the main features and shape of the quarter-acre park have been narrowed down, tonight was about refining those decisions and coming up with the fine details like color schemes, landscaping, furniture, and equipment. Highland Parkers, ready to plan. At this point, part of the City requirements is that the property be fenced. The size and style of that fencing has yet to be determined. The prevailing consensus among the evening’s participants is that they would prefer as low and as least obstructive fence as possible. An interesting component of this new park is that it will have a surveillance camera that is not monitored, but only used for recording. Design #13, the best of everything. 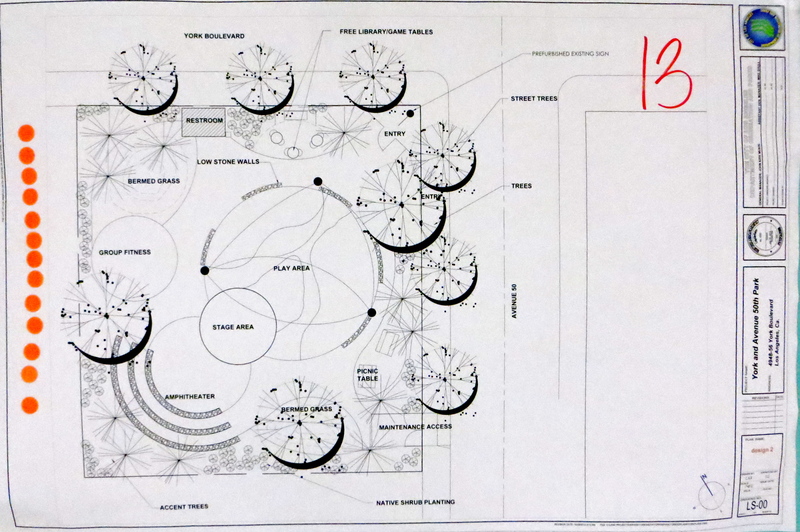 If all goes as theoretically planned, we will have the most pimped-out city pocket park in Los Angeles. 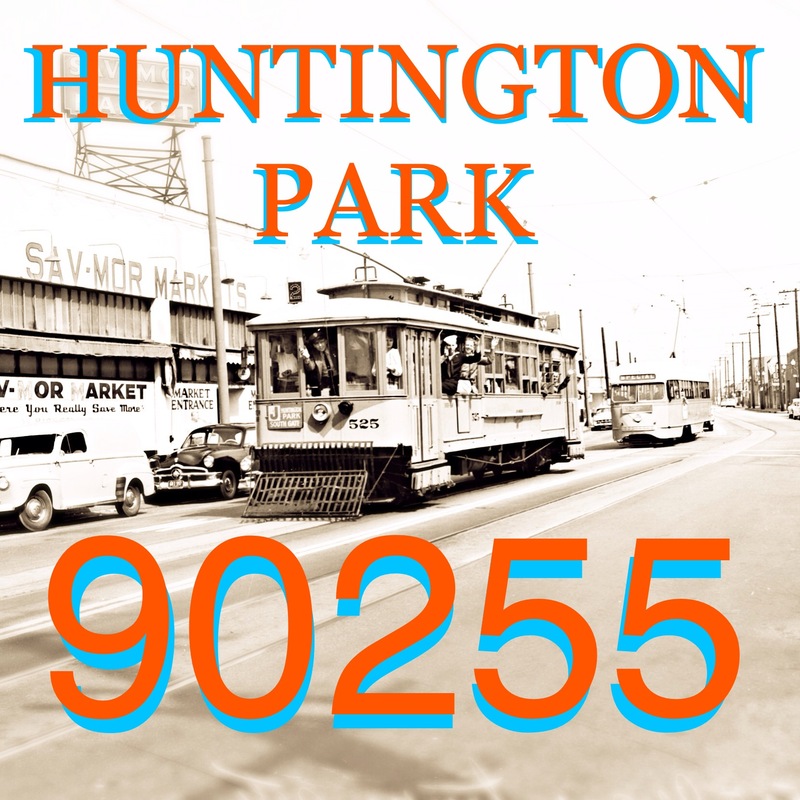 Art, mini library, play equipment, chess tables, lawn area, an amphitheater, a stage, exercise equipment, water play area, picnic tables, benches, a public restroom, shade structure, native trees and plantings are all possible options on the table at this point. Not everything will fit, but most of it will be part of the final plan that will be voted on by the community when the final design presentation is held on Saturday, December 7th at 10AM in the park site at 4956 York Boulevard. The public will have the day to stop in and vote their choice for the winning design. The park is expected to be completed by this time next year. Plan #3 has a water play area. Plan #12 puts the restroom on the Avenue 50 side. Many park furniture options to chose from. tags: business, donut, doughnut, food, Highland Park, los angeles, york blvd. Highland Park has long been considered a special place, but now it is a very special place because right now it is the only place in the world with a Donut Friend. Northeast Los Angeles is no stranger to the Donut Arts. This after all, is where the most powerful donut empire in the Western United States began with Yum Yum Donuts in 1971 on the corner of Figueroa and Avenue 26. And while 90042 may still be home to the best glazed donut in Los Angeles at Monterey Donuts in Hermon, Donut Friend has upped the game considerably. Over in the East San Gabriel Valley, Glendora’s Donut Man has been blowing people’s minds for decades by putting fresh fruit on their donuts. Which is awesome. But Donut Friend has electrified the acoustic guitar of pastries, their donuts goes to eleven. Jam, cheese, bacon, bananas, basil, nutella, mint, fudge, olive oil, jalapenos, sriracha, ice cream, chocolate mousse, candied oranges, caramel, and sugar glaze are among just a few choices you can put on you’re basic $2 vegan traditional or cake donut. 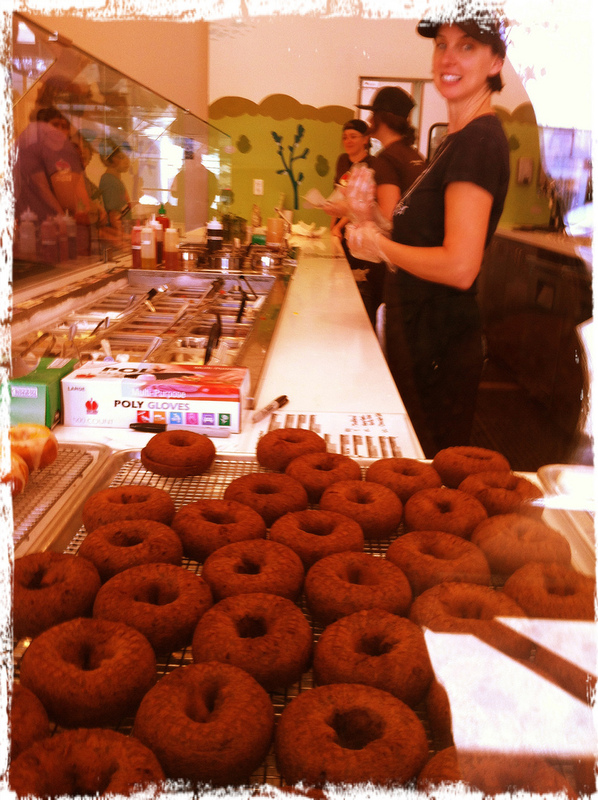 (For $2.50, you can get a stupid-healthy vegan baked donut.) The D.I.Y. donut option is a fun way to show yourself and your friends (who are not donuts) what an awesome or awful pastry chef you could be. But don’t let that stress you out, there is a list of Donut Friend Compilations where you can show off your music prowess by getting the band and song references that the donuts are named after. (Fudgegazi = Fugazi, Lemon Weapon = Legal Weapon, GG Almond = GG Allin, Caramel on Parade = Christ on Parade, Dag Nutty = Dag Nasty, Jets to Basil = Jets to Brazil, Rights of Sprinkles = Rights of Spring, etc…) The donuts are good. Really good. I find myself avoiding York Blvd all together, just to keep from eating too many of their donuts. To go with these spectacular donuts, they have the usual milks and juices, but also serve a surprisingly good micro-roasted coffee from The 909, called Klatch. They also make pre-made donuts that you can pre-order by the dozen and be the most popular person in your office. The backstory about Donut Friend is that when multi-platinum record producer, Mark Trombino (Jimmy Eat World, Blink 182, The Starting Line) had to “Go big, or go home,” he went donut. Inspired by Donut Man, he decided to open a kustom donut shop on York Blvd where there was a Chinese massage parlor previously. The happy ending for us is that while people from all over will be driving here to try Donut Friend, we can simply walk over and indulge our fancy any time between 8AM and 7PM, seven days a week. The Lemon Weapon. Named for local band, Legal Weapon. Go ahead, build your own if you dare. Happy donut mural by Saelee Oh. Sriracha on everything can’t be wrong. The GG Almond. Nothing like the bitter dirty bloody covered in feces singer it is named for.